Johann Caspar Kerll studied with Carissimi in Rome and worked his way up through the ranks at the Munich court. He was ennobled by Emperor Leopold I in 1664 and it is supposed that he became the organist at the Stephansdom in Vienna. His Missa in fletu solatium obsidionis Viennensis (published 1689) was composed to commemorate the harrowing siege of Vienna by the Turks in 1683; Peter Wollny’s essay observes that ‘its gloomily imploring tone allows us to sense but little of the relief over the happy outcome of the siege’. This is borne out by the subdued Gloria setting in Cantus Cölln and Concerto Palatino’s expertly balanced performance: the solemnly expressive ‘et in terra pax hominibus’ makes it seem as if peace on earth to all men has come at a steep price. Kerll’s dignified and sincerely supplicatory Agnus Dei becomes increasingly anguished when it reiterates ‘Dona nobis pacem’. 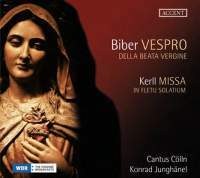 The headline attraction is Biber’s Vespers, just one of three cycles contained in a large publication of music for the court of the Prince Archbishop of Salzburg, although the programme is fleshed out using four relatively intimate motets from Kerll’s Delectus sacrarum cantionum (Munich, 1669). Cantus Cölln’s performances ebb and flow masterfully through Biber’s declamatory and astonishingly concise psalm settings, such as the rapid ‘Nisi Dominus’, constructed cleverly over a perpetually moving descending basso continuo line.